While 1 Berkeley Square sits on Lot 1 and the east 40 feet of Lot 2, the house was actually built after most of the Square's lots were improved. William Walden Gray Jr., born during the Civil War, was from the long line of Grays of Grayville, Illinois, on an oxbow of the Wabash not far from Evansville, Indiana. No doubt influencing his move west, one of W. W. Gray's brothers, Harry P. Gray, had come to California in the '90s, in 1901 building a big if short-lived West Adams house—demolished the same month W. W. would be buying his Berkeley Square parcel—at 19 Chester Place. In March 1916, The Title Insurance and Trust Company, acting as trustee for a syndicate of owners, sold W. W. the combined Berkeley Square lots for $25,000 in cash. Gray was described by the Times as a "local capitalist"; he had been visiting Southern California for years before deciding to put down winter roots in Los Angeles with his wife, Birdie, and their three daughters, Mary, Dorothy, and Margaret. After purchasing the Berkeley Square parcel, the family rented at least two houses in the neighborhood, perhaps with the idea of keeping an eye on the upcoming construction of their new house, or to be sure they wanted to proceed with the plans. Their first rental was oilman Richard W. Hanna's house 2245 South Western Avenue, just outside the gates next to the new property. life on Berkeley Square for many years. There is a story among Gray descendants that one of the most renowned Southern California architects may have designed #1. Wallace Neff married Louise Up de Graff the same year that Dorothy Gray married Louise's brother, five years after #1 went up. Neff was just beginning his career at the time, and, according to the Pacific Coast Architectural Database, was working in 1919 as a draftsman in Santa Barbara for the great George Washington Smith; the PCAD does not list the Gray house among Neff's projects, or among Smith's. Neff was descended from Chicago map publisher Andrew McNally (of Rand-McNally), and it's certainly possible that the two important Illinois families might have known each other before the marriages. The family connection to such a celebrated Southern California architect would naturally have led later Grays to assume that he was the original designer of a family residence. Permits issued by the Los Angeles Department of Buildings on October 31, 1919, however, reveal the actual details. As it turns out, another esteemed designer, and one farther along in his career than Neff, was responsible for 1 Berkeley Square. 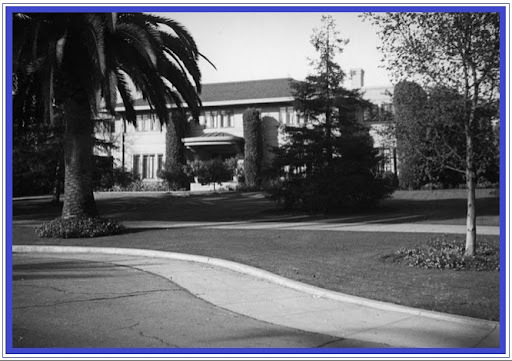 Among the domestic projects under the belt of George Lawrence Stimson of Pasadena was the William Wrigley House in that city (originally commissioned by the architect's father in 1906, sold to the chewing-gum mogul in 1914 and donated to the Tournament of Roses Association in 1958) and the similar 1913 Isaac Milbank house, also still standing, on Country Club Drive in Los Angeles. The 14-room house Stimson designed for the Grays appears in photographs to be a precociously sleek version of the Wrigley and Milbank houses; as indicated on the original permit, its footprint was to measure 89 by 65 feet, with the project budgeted at $36,000. 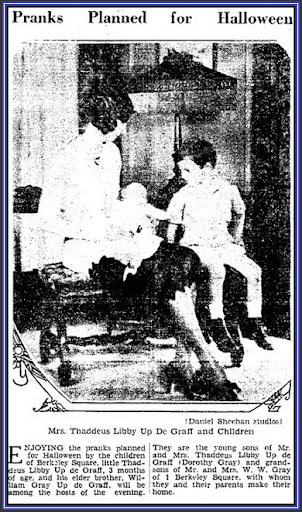 Interestingly, further investigation reveals that Gray descendants were not altogether wrong in their assumptions after all: Alteration permits issued on April 13, 1932, indicate that Wallace Neff designed the conversion of a sleeping porch into a bedroom; keeping it all within the family, Thaddeus Libby Up de Graff was the contractor. Another bit of family lore has it that Allen, another brother of William, may have provided the funds for Birdie to build the house since W. W. wasn't keen on a move to California and was perhaps balking at coming up with the funds himself, at least for so lavish a house. It could be that the ailing Allen left such a provision in his will—he would die in 1920—and encouraged the Grays to improve their two lots sooner than they might have anticipated. The family had actually arrived on Berkeley Square before their own house was completed; after their stay in the Hanna house around the corner, the Grays rented #22 from George Merritt Jones, before that house's purchase by film producer Hal Roach. Number 1 was clearly one of the larger houses on the Square, centered as it was on two lots. We've identified the picture at top by matching the apparent footprint of the east end of the house with the shape designating the structure on the 1921 Baist insurance map (though this is perhaps not always the most reliable way to identify a building) and, perhaps more positively, by the contour of the street (eliminating the known house at #24 at the diagonally opposite corner of the square). William Walden Gray Jr. died on February 18, 1942, and was buried in the Gray Family Burying Ground in Grayville. Number One Berkeley Square was on the market in 1949; his widow was still listed there in the 1950 Southwest Blue Book, though she is known to have moved away soon after, and certainly by 1955. 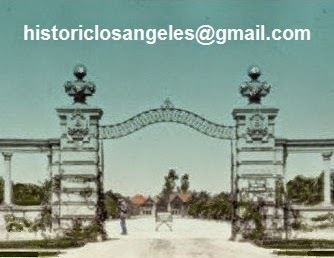 According to the Los Angeles city directory, William A. Ellis was in residence by May 1956.